The €470m ($611m) Amager Bakke waste-to-energy plant is being built in the outskirts of the Danish capital Copenhagen. Image courtesy of BIG-Bjarke Ingels Group. The Amager Bakke waste-to-energy project will treat 400,000t of waste per year. Image courtesy of BIG-Bjarke Ingels Group. The ski slope roof structure of the waste-to-energy plant will offer a recreational avenue for Copenhagen residents. Image courtesy of BIG-Bjarke Ingels Group. The plant will release smoke plumes in the form of large smoke rings illuminated by lasers. Image courtesy of BIG-Bjarke Ingels Group. The Amager Bakke combined heat and power (CHP) complex is being built in the outskirts of the Danish capital Copenhagen. It will be one of the largest waste-to-energy plants in northern Europe. "The Amager Bakke waste-to-energy plant will burn waste collected from 500,000 – 700,000 inhabitants and 46,000 companies." The €470m ($611m) innovative project is being developed by the Copenhagen-based waste management company Amager Ressourcecenter (Amagerforbraending). Amager Ressourcecenter is jointly owned by five Copenhagen-area municipalities, namely Dragør, Frederiksberg, Hvidovre, Copenhagen and Tårnby. The new facility will replace the adjacent 45-year old waste-incineration plant, which is currently producing heat and electricity for 150,000 households. It will have the capacity to treat 400,000t of waste annually to produce electricity and heat for 150,000 homes in Copenhagen. The waste-to-energy plant will be equipped with the latest waste treatment technologies for greater efficiency and better environmental performance. The plant will also feature a ski slope on its roof to offer recreational facilities for the city residents. The construction of the project started in March 2013, with completion scheduled for 2016. The Amager Bakke waste-to-energy plant will burn waste collected from 500,000 – 700,000 inhabitants and 46,000 companies in and around Copenhagen. It is designed to utilise 100% energy content of the waste. The plant will have more than 25% more energy output than the existing plant, which is Europe’s oldest waste-to energy plant. It will generate steam at a temperature of 440°C and with a pressure of 70 bars, doubling the electrical efficiency compared to the existing plant. More importantly, the new plant will reduce nitrous oxides (NOx) emissions by 85% and bring down the sulphur content of smoke by 99.5%, compared to the existing plant. The new plant is expected to offset emission of 107,000t of carbon dioxide (CO2) emissions per year compared to a conventional coal-fired plant. The facility will include two furnace lines connected to a boiler and a joint turbine and generator system. Each fuel line will have a capacity to burn 35t of waste an hour. "The construction of the project started in March 2013, with completion scheduled for 2016." The waste will be lifted through a crane and fed to a double lane combustor grate with the use of a hopper. The plant will use Babcock & Wilcox Vølund’s advanced combustor grate, called DynaGrate. It is a water-cooled combustor grate resembling a staircase. The grate bars are alternately arranged and are mounted on shafts to optimise the agitation of fuel bed. The mechanical design of DynaGrate offers optimised combustion of the waste fuel with its capacity to process a variety of waste materials, including metal. It also involves reduces maintenance cost with its wear zone consisting of steel tubes. In addition, the movable grate parts do not come in contact with each other, which further reduces maintenance costs. The plant will use flue gas condensation technology to optimise the heat production. An electrostatic precipitator (ESP) will be used to catch the particles in the flue gas. A flue gas cleaning technology, called selective catalytic reduction (SCR), will also be installed to reduce the NOx emissions. The smoke plumes of the plant will be released in giant 30m smoke rings and each ring will be blown as a visual spectacle for releasing every single tonne of fossil CO2. 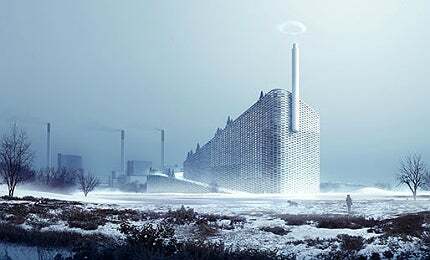 BIG-Bjarke Ingels Group is the architect of the Amager Bakke waste-to-energy plant. Other contractors involved in the structural designing of the new plant include Topotek/Man Made Land and AKT. Realities:united will provide the smoke ring generator. Ramboll is involved as the owner’s engineer and is providing planning and commissioning services. B&W Vølund was awarded a contract worth $170m in October 2012 to design and supply the firing equipment, combustion and energy control system and environmental equipment. The company will also provide the DynaGrate, boiler, slag and ash-handling equipment, as well as environmental equipment, such as ESP and SCR. In February 2013, NCC was awarded a $39.32m contract to carry out construction works (silos, earth and concrete works) of the new plant. The total contract value may reach $48.29m with possible additional construction works assigned to NCC in future. The 160MW Horns Rev (Horns Reef) offshore wind farm has 80 turbines off the west coast of Denmark’s Jutland peninsula. Anholt Offshore Wind Farm is a large-scale wind farm being built between Djursland and the island of Anholt in the Kattegat.